SINGAPORE -- Venus Williams reached the semifinals at the WTA Finals by beating Wimbledon champion Garbine Muguruza 7-5, 6-4 on Thursday. The 37-year-old Williams advanced from the White Group along with Karolina Pliskova, who lost to French Open champion Jelena Ostapenko 6-3, 6-1. Both Williams and Pliskova finished with 2-1 records. Williams, who first reached the No. 1 ranking in February 2002, was asked how she has managed to have such a long career. "I use a lot of sun protection, sunscreen. I eat a lot of fruits and vegetables," Williams said. "That's been the key to my success." Williams won the WTA Finals in 2008 and reached the final in 2009, which was the last time she appeared in the year-end tournament. 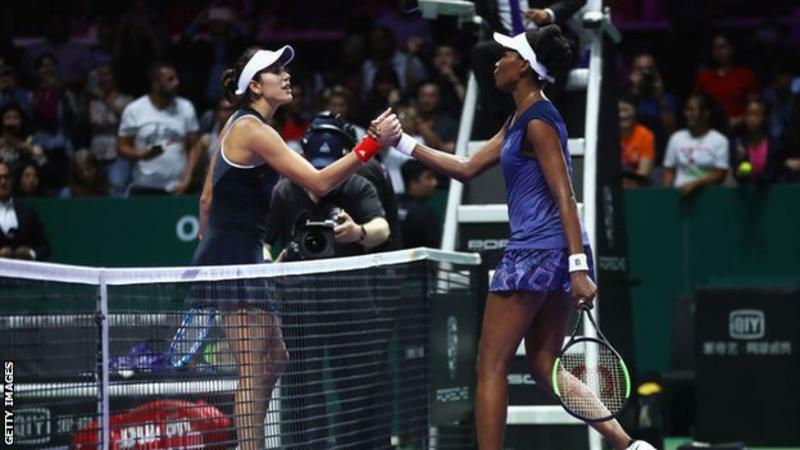 On Thursday, Muguruza made 32 unforced errors to 26 for Williams. "I'm very proud of this year." said Muguruza, who reached the No. 1 ranking for the first time this season. "I knew here that it's going to be tough, the best eight players are playing."